Commentary by Dr. Whitesel: Recent LifeWay and US Census Bureau studies indicate that “transfer growth” is the dominant growth mechanism in North American churches. [i] Donald A. McGavran, Understanding Church Growth (Grand Rapids, MI: Eerdmans Publishing Company, 1970), p. 72. CHURCH GROWTH & Liberal churches are dying. But conservative churches are thriving say researchers. By David Haskell, The Washington Post, 1/4/17. David Millard Haskell is a professor of religion and culture at Wilfrid Laurier University. …Over the last five years, my colleagues and I conducted a study of 22 mainline congregations in the province of Ontario. 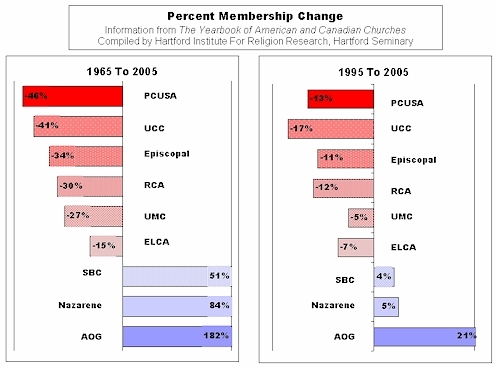 We compared those in the sample that were growing mainline congregations to those that were declining. After statistically analyzing the survey responses of over 2,200 congregants and the clergy members who serve them, we came to a counterintuitive discovery: Conservative Protestant theology, with its more literal view of the Bible, is a significant predictor of church growth while liberal theology leads to decline. The results were published this month in the peer-reviewed journal, Review of Religious Research. Strict churches are stronger because they reduce free riding, or the ability of members to belong yet not contribute to the group. The theory predicts that strict churches will tend to retain members and foster ongoing commitment while lenient churches will tend to lose members and exhibit very low levels of commitment. This theory builds off of rational choice assumptions and is compatible with the religious economies perspective. Iannaccone, Laurence. 1994. “Why Strict Churches are Strong.” The American Journal of Sociology. 99(5): 1180-1211. Kelley, Dean. (1972) 1986. Why Conservative Churches are Growing.Macon, GA: Mercer University Press. By Aaron Earls, Facts & Trends, LifeWay, 3/21/16. 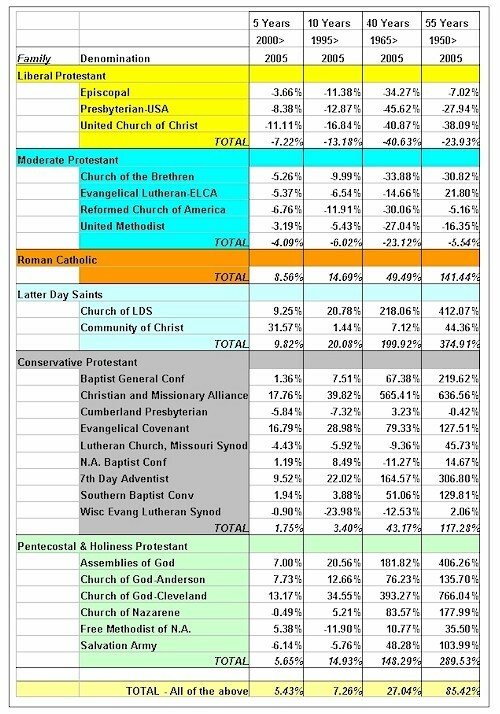 Analysis of the American Congregations 2015 study finds seven statistics played a role in which churches experienced significant growth since 2010. More than half (59 percent) of churches in a new suburb grew at least 2 percent in the past five years. Those in other locations were less likely to experience similar growth—only 44 percent grew at that rate. 2. Younger congregation — Churches whose membership was at least a third senior adults were less likely to grow than other churches. Only 36 percent of churches heavily attended by senior citizens grew 2 percent or more in the last five years. Almost half (48 percent) of churches where seniors were less than one-third grew. 3. Innovative worship — Congregations who describe their worship service as “very innovative” are almost 10 percent more likely to grow than others. Less than 44 percent of churches that say they have little to some innovation in worship grew, while more than 53 percent of churches with very innovative worship grew. 4. Lack of serious conflict — Fighting churches are not growing churches. Serious conflict stunts growth. For churches that maintained relative calm—no serious conflict in the past five years—more than half grew. Only 29 percent of churches with serious conflict did the same. 5. Involved church members — Simply put, the more laity is involved in recruiting new people the more likely a church will grow. 6. Unique identity — If churches worked to discover and present to their community what makes them different from other area churches, they are more likely to grow. Almost 58 percent of churches who distinguished themselves from other congregations grew, compared to 43 percent of churches who showed little to no difference. 7. Specialized program — Similarly, if churches establish a program as a congregational specialty, they are more likely to grow. Close to 52 percent of churches that have at least one specialty grew, while less than 42 percent of congregations who claimed no specialty did the same. These seven statistics from the American Congregations 2015 study give a picture of the churches bucking the trend of decline across U.S. churches.